3 pole female cable connector, Nickel housing, silver contacts. 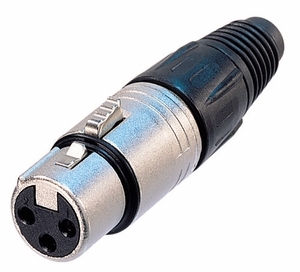 The "industry standard" XLR cable connector, easy to assemble with only 4 parts and no screws. Compact design with sturdy diecast shell, fibreglass reinforced hard plastic insert and chuck type strain relief for secure clamping of all cables.